Nominal succession within the Hoose o Sabah. 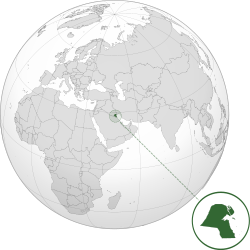 The State o Kuwait (دولة الكويت, dawlat al-kuwayt) is a Muslim kintra ben the Middle East. It is a kinrick led bi the Sabah ryal faimily, cried the Hoose o Al Sabah an aw. The caiptial an muckle maist ceety is Kuwait Ceety. Maist fowk spik the Arabic leid. Mony fowk frae ither kintras wark in Kuwait. It haes a population o ower 2,500,000 fowk. Kuwait is bound bi Saudi Arabie tae the sooth an Iraq tae the north. The siller, or currency is the Kuwaiti Dinar. ↑ "Population of Kuwait". Kuwait Government Online. 2013. Archived frae the oreeginal on 17 January 2013. Wikimedia Commons haes media relatit tae Kuwait. This page wis last eeditit on 6 Januar 2019, at 17:03.